– At the same time press your hips and pubic bone into the floor, this will straighten out the backs of the legs, and lift the front of the knees off the floor. Apply a little more pressure into the floor with the tops of the feet, hips and pubic bone. You will automatically start to feel the head and chest rising upward. First let the legs do their work with maximum strength. Using no pressure from the hands. When the head and chest reach to the maximum height from the power of the legs, apply just a little pressure into the hands, to lift a slightly higher. Be sensitive, careful that you do not pressure the lower back too much. Do not straighten the elbows; if you do the arms will take away all the weight of the upper body. It is the legs that are to do the most work here. 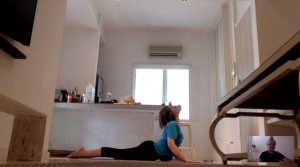 If you straighten the elbows, the technique of the pose will be lost, and you will convert the pose partially to Urdhva Mukha Svanasana (The Upward Facing Dog Pose). So let’s just focus on the cobra for now, I will write on the dogs later! So, keeping the elbows slightly bent will ensure the legs don’t get lazy! If you start to notice too much tension in the arms, you simply have to apply more pressure into the pubic bone and tops of the feet. While keeping the pubic bone and tops of the feet working strong into the floor, slowly push your lower ribs forward, these are very subtle movements so don’t go and over do! Gently reach with the top of your head towards the buttocks. Often when the head is reaching back, some tension will form on the forehead particularly if you are lifting your eyebrows, some people even blink rapidly… these are just silly habits. If you notice that you are an eyebrow lifter, simply point the pupils of the eyes towards the tip of the nose, that should sort out that little problem! Keep the chest at the same height, and slowly draw the shoulders down. As if you are releasing a shrug. Here, all the organs in the belly get stretched, stimulated and toned, the chest is opened and the passages for the heart and lungs are cleared. The shoulders are strengthened, and circulation of blood and oxygen throughout the spinal and pelvic region are improved. For those who find a little too much tension in the neck, all you need to do, is draw the chin slightly in towards the throat. From time to time, reach again upwards with the chin, this will inspire a healing process for tight necks. If you are feeling strong, try this little trick. This will take you slightly deeper into the back bend. Remember the hands do not move. Be very sensitive to the spinal column as you do this. Less experienced people or people who need to be more sensitive with back bends can do ardha bhujangasana (half cobra pose) instead. Instead of hands under the shoulders, put your elbows directly under the shoulders, with your forearms and fingers pointing straight forward and flat on the floor. Keep your chin horizontal and the top of the head reaching straight up towards the ceiling. In most backbends (stretching the front parts of the body and spinal column) the inhale is the active breath and the exhale the passive. Then activate again reaching a little further on the next inhale etc. Dhanurasana is an excellent stretch that removes rigidity from the spinal column. It will also tone the belly while strengthening the organs in the abdominal cavity. How do I prepare for bow pose? A warm up is required for this pose, so it is best not to go straight into it. The intentions of this article and any article that I put out about yoga postures, is simply to make you more aware of the technical side of the poses in your yoga sequence. So, when you get to dhanurasana, lay face down, bend your knees and reach back to grab your ankles. If you cannot yet grab your ankles, leave out dhanurasana for now. Be patient with your body. You can work with other postures such as early variations of salabhasana (locust pose). Those who are more flexible can hold on to your shinbones moving closer to the knees as you develop further. Start by pushing your abdomen into the floor. That’s right your abdomen, not your hips. The arms and legs will feel like they are pulling against each other quite strongly. This will happen. Now with the mind convert the action by making the arms and legs work together to lift the toes higher. On the inhale push the belly stronger into the floor, keep that pressure, then on the exhales lift the toes higher still. Work with the breath, allow a little movement, and avoid keeping the pose stagnant. Keep your chin horizontal, and the top of the head reaching up to the ceiling. Using the imagination is very useful with this kind of work. So in this case imagine that you are a bow. The body from the head to the knees resemble the bow. The arms and the shinbones are the string. The hands and feet is where the archer is pulling the string to maximum length to shoot the arrow at highest speed! Hold anywhere from 5 to 10 breathes, be watchful of where the tensions are in the spine. Come down and relax as soon as you need to, then give it another go! Throw in the technique of lightening the mind, a tense mind will only make the body tense. Keep the face muscles also relaxed, and you will find the pose to be a breeze in no time! A wonderful stretch for the arms, shoulders, spine and legs. Increases power throughout the body, relieves weariness and invigorates, improving the immune system, digestion and blood circulation, and my favourite: it uplifts the mind. Downward dog pose is perhaps the most utilised pose in the yoga tradition. It is in the sun salutations, vinyasa and several other classical and contemporary yoga sequences for everyone from beginners to the well-experienced practitioner. When performing Downward dog pose, press the centre of your palms into your mat, this will engage both sides of each hand, and take a little pressure off your wrists. Apply enough strength to the centre of the palms so that your forearms and upper arms feel longer and stronger. Point your feet straight forward, keeping them shoulder width apart. Press your heels toward the mat to start a warm up stretch for the legs. As the muscles ease into the stretch, take it a little deeper; keep pressing your heels downward and at the same time, lift the sitting bones toward the ceiling. Remember to keep the arms engaged as you apply more power toward the centre of the palms. Place your ears between the biceps. With a pivoting action at the head, pull your throat sensitively back toward your neck and reach with the top of the head to the space between the two hands. This will lengthen your spine further. On the inhale ease up slightly and on a lengthy exhale reach to your maximum. You could take it even further by pressing the centre of the under arms toward your toes. Do this only if your body is feeling strong in the pose. 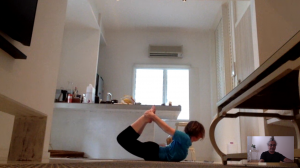 There are so many different layers to this pose and multiple subtle variations to be discovered in your own practice. A pose positively worth experimenting with, with full attention. It is so easily accessible, and one of the best ways to remove accumulated stress throughout your body so that you can stay on top of your game by performing at your best. A subtle posture adjustment, to empower you in any situation. Draw your throat in towards the back of your neck, and gently reach up to the crown of your head. This will instantly improve blood circulation in your spinal cord. So, why is that a good thing? Because your spinal cord is a passage of communication from your brain to the rest of your body. Your whole nervous system is connected to your spinal cord, so it is vital that you keep it as healthy as possible. Think about this. When the lines of communication are free from obstruction (such as slouching, or habitually poor posture due to a variety of stresses), you will inspire good health and increase your overall personal effectiveness. And my favourite: Compassionately rise above the dreary moods of others around you with style and grace! The technique is often practiced with yoga poses, it is known as Jalandara Bandha. Depending on the pose, the bandha has a range of variations. A well-experienced teacher will be able to guide you through them. The most important point is to avoid too much force. Reach to your maximum, and relax your effort as you hold the posture. You don’t need to push too hard to experience the benefits of Jalandara bandha. So wherever you are, standing, sitting or lying down – Draw in your throat towards the back of your neck, and gently reach up to the crown of your head. Try it now, you will feel empowered instantly. I guarantee it! If this technique brings to mind anyone in your circle of friends, family or colleagues who may be interested in developing their personal effectiveness, I would be honoured if you shared it with them. Thank you! Never miss a post: Sign up for FREE TIPS to live more skilfully!